I have featured the vile (I’m being restrained here) anti-Israel Boycott Divest Sanction movement before, including their attempts to disrupt businesses owned by Israelis or doing business with Israel. The BDS movement is an iteration of the Islamist-Leftist Anti-Israel Coalition. IsraellyCool has come up with a great Buycott poster highlighting companies which do business with Israel and which deserve our support. I am the happy owner of a Motorola smart phone. One big reason I bought it was this buycott. My new computer has Intel inside, too! I support & buy many of these products & services. Good to know. The rise of anti-Semitism is disturbing. I stand with Israel, and I deplore anyone who blames them for the problems in the Middle East. Islam is the problem. Period. I’m going to go buy a cup of coffee and a candy bar, and I may head over to McDonalds for some of their delicious french fries later. I’m eating some yogurt with strawberries right now. Go to hell, you ugly Jew haters. I’ve already had my Starbucks today. I don’t agree with all of their corporate positions, but this one I do. Thank you very much for posting the video! Seeing the anti-semitic “aparthied’ demonstrations every year on Locust Walk has been depressing and I am so glad that there was a spontaneous response such as the one shown in the video. Did you also notice when Biden came to campus with full police surroundings but the same week, the university sabbotaged the Eric Cantor speech by encouraging the Obama-sponsored OWS off campus mob to occupy Huntsman Hall where Cantor’s speech was to be held? He backed out due to the obvious security dangers. Of course 2 days earlier, Biden was not even available to anyone but a select press group and some University VIP’s. I work for Nestle but never knew we were being targeted by anti-Semites. Glad to know my company’s on the right side of this affair. Feed your pets Purina brand! I always go out of my way not to buy any products made in Arab countries cuz you just don’t pay for the bullets with which they wanna kill you. 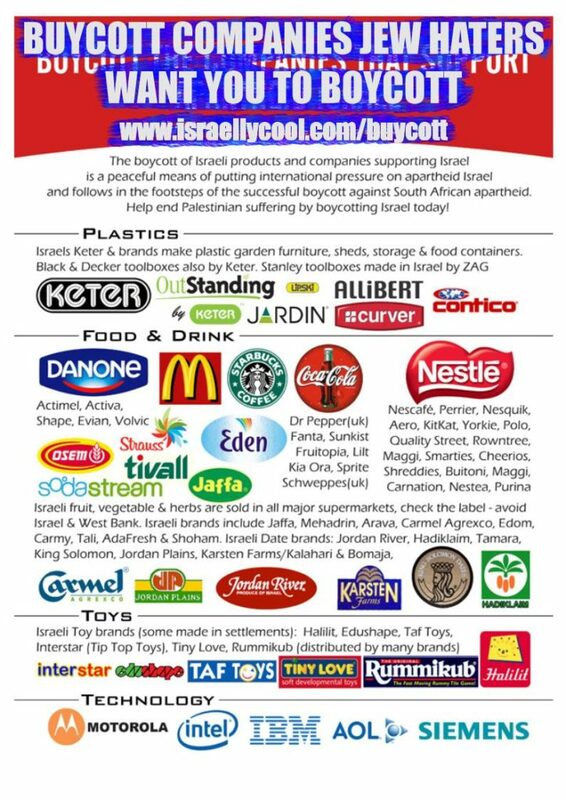 However, I’ll buy anything Israeli Jewish produced and support any company which supports Israel. My bucks will never support Jew hatred. No common cause with Communists and Islamists, neither of them have a taste for freedom. No song & dance video by the motley troupe? Thanks for this. I am not Jewish, but I will support these companies enthusiastically with my purchases. I make it my business to buy Sabra brand hummus at the grocery store. I know it’s made here in the U.S., and have no idea if it’s tied to Israel at all, but with a name like Sabra you can be sure it’s not Arab and not Jew-hating! And I buy Israeli-related products whenever I can. Regarding the (original) poster, “peaceful” and “Palestenian” don’t belong in the same sentence – it’s an oxymoron, with emphasis on the moron. Sabra is my favorite brand of hummus. Nom nom nom!!! My wife and oldest daughter are the world’s biggest hummus fanatics. I told them about the Professor’s previous posts on Sabra and they also make a point of buying it now. The internet makes it easy to thwart these boycotts nowadays. Sabra is a partnership between PepsiCo and Strauss, the Israeli food giant (which also owns Elite). I’m going grocery shopping today–will be sure to pick up items by all the makers on this list. I remember hearing quite some time ago from a Jewish aquaintance that one of the major Japanese car manufacturers didn’t sell their cars in Israel. I think he said it had to do with not upsetting their Arab trading partners (oil, etc.). If that is (still) true, I would imagine it would be all the major Japanese car manufacturers. He said he wouldn’t buy Japanese cars as a result. Subaru have been very big sellers and are very popular cars in Israel. There was a time when you couldn’t get Toyota here because of fear of the Arab boycott. However that is long gone and you see Toyotas everywhere. My parents have had one for years. We drive a Mitsubishi now but had a Honda (sniff.. my beloved Honda. It died) for 14 years. There are Nissans and Suzukis and several other Japanese makes so I’m not sure if there’s any boycott/embargo at all any more. Sadly, BDS is staging their 3 day (Feb 3-5) orgainizing demonstration at the University of Pennsylvania. The same University that was recently the recipient of 250 MILLION from noted Jewish Philanthropists, Raymond and Ruth Perelman. Steve Wynn (born Stephen Alan Weinberg) also gave millions to Penn, to help build the commons area where the University is letting outside left-wing groups foment this spectacle of Jew Hating. The university president is Amy Gutmann, whose father fled Nazi Germany to bring his family to this? This is the suicide of American Jews led by left wing academia. My son is close friends with Mr. Wynn’s grandson. My wife has forbade me from bringing up politics with the boy’s mother (Mr. Wynn’s younger daughter) at their lacrosse matches, but I wonder if he knows about this? Noted for his rants against Obama, I doubt he’d approve. What’s happening to me? I also spelled “divine” “devine” recently in the tip line. I’m losing it. I’ll double my cocoa intake. I would agree with your wife as a matter of policy! Kidding aside, maybe Mr. Wynn or Mr. and Mrs. Perelman will give a tap tap tap on the phone to Ms. Gutmann? Thanks for the notice and I’m glad that at least some people are opening their eyes about this kind of thing. Nestle’s chocolate, eh? I’M ON IT. I’m switching from Hersheys to Nestle cocoa. I make a few cocoa and soy milk shakes every day (no sugar). Very healthy (cocoa beats blueberries for antioxidant power) and the cocoa seems to help my depression. Could be a placebo effect, but that’s okay with me. LukeHandCool (who perhaps missed a calling as a dietician). Not surprised it helps your depression, as serotonin is manufactured in the GI tract. Siemens is a German company. Anyone see the irony here, anti Israeli boycotters don’t want people to buy from a German company because the Germans have been too easy and supportive of Jews? Is there a list of Arab/muslim/islamist companies? That’s a boycott I can get behind. I like it when Instapundit points out deals on specific items and maybe has a comment or two. While I try to support the listed companies, it’s better if a deal or two of a specific product were pointed out every couple days that would support them. I am just so unfamiliar with most of those companies and their products. Plus you could get the Amazon credit for the website.